Choose from a range of sizes, styles and finishes, and upload your logo for a completly bespoke packaging product. If you would like to speak to one of our customer account managers, call 0845 338 1741 or submit an enquiry to info@preciouspackaging.co.uk. Customise your own luxury paper bag with different sizes, finishes and handle types. Enhance your brand with full color, custom printed postal boxes. Print any color or design with quantities as low as 250 sheets. Create your own luxury printed ribbon. Add your logo to our high quality suit carriers. Order our printed, cotton bags online. Order custom boxes, luxury carrier bags and tissue paper online. Start by contacting our 5-star rated customer service team and receive an instant quote today. We manufacture our printed packaging to your exact sizes which you can customise with the likes of hot foil or spot UV. Our highly qualified UK based design team will ensure you are guided through the process. I needed a cookie box with my company's brand and design. Precious Packaging has been incredibly helpful, from the very beginning and very patient listening to all of my requests! I dealt with Katie during the whole process and she was outstanding, from answering emails very fast to delivering amazing cookies box! Thank you Katie and Precious Packaging. Will definitely use your service again and would absolutely recommend to anyone. Our company used Precious Packaging to help produce a promotional box and branded tote bag to go inside. The guidance received from Andrew Harper throughout the process was exceptional, and the print and finish quality of both items exceeded our expectations. We will use Precious Packaging again for future requirements, and would highly recommend. Just wanted to let others know that Precious Packaging are second to none in terms of packaging and delivery of goods. The level of knowledge that Ashleigh had for our requirements enabled the process to run extremely efficiently. There is nothing I can criticise about my dealings with Precious. Lindsey's customer service is without doubt amongst the best I have received anywhere - so fast, efficient, flexible, courteous and fun. The products are A1. The price is right. I had a very happy client and that is all I could wish for. This is the first time I have used PP, and after having used many other packaging and bag companies in the past, I will not hesitate before going back again. Thank you. A perfect option to get some inspiration, see our excellent quality and what we've produced recently. Create your packaging exactly how you want it. Giving you complete peace of mind for your full order. Our friendly customer service team is always available to chat to you about your requirements. We offer competitive pricing and delivery on all our beautiful tissue paper, custom paper box and carrier bag lines. We pride ourselves in providing marketing & branding agencies a one stop solution to sourcing for their entire client base. All our luxury boxes & printed carrier bags are available in a wide variety of different styles which mean your brand will benefit from uniquely recognisable packaging, carefully designed down to the smallest detail by our creative team. With so many options to choose from, whether it be in store, on the street or in your customer’s homes, it will serve as a positive example of your brand’s great quality. When your brand’s logo is seen on one of your beautiful personalised bags or custom boxes, whether it be in store, on the street or in your customer’s homes, it will serve as a positive example of your brand’s great quality. As packaging specialists, our helpful staff can guide you through the process. From designing your printed paper bags to organising delivery you’ll be in safe hands. Our packaging designers have years of experience and will be more than happy to help. During the design phase we will work with you one-on-one to develop your concept and create your perfect packaging. Just select your options, upload your artwork and we’ll be in touch to guide you through the rest of the process and get your items into production. Don’t worry if you don’t have artwork ready at this stage, we can help! Offering bespoke printing solutions on all our printed paper boxes, carrier bags and bespoke packaging. Available in a wide range of colours, materials, finishes & special textured papers. Our unique personalised bags & custom boxes will help your brand fulfil its potential and leave a lasting impact from the very first moment. With low minimum quantities and speedy delivery times available, we offer many products including; paper bags, eco-friendly bags, custom boxes and many more. Need a bespoke sample produced? Just get in touch and we'll help. You can now order a selection of our most popular printed packaging directly online by giving you multiple options for common sizes and finishes you can save over 10%. Online ordering is available for personalised bags, printed cotton bags, printed tissue paper and more. 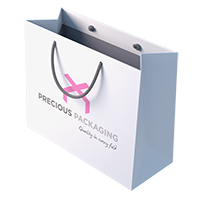 Use our packaging builder to customise and purchase you paper bags online. Edit all aspects of your bag including handle type, colors, size, material finish and logo position.